The Health Effects: How do you know when a substance is toxic to your health? Every day we deal with different kinds of toxins in our environment. We can’t always control exposure, but we can do our best to make sure the environments we work and live are not contributing to the problem. Chemicals can harm us when they enter our bodies. Determining what substances in our environment can cause long term harm to us depends on how the body processes the chemical and the different ways your body reacts to the exposure. Toxic substances don’t always come from chemical exposure. It can also come from natural sources like mold. Do toxic substances cause harm? The short answer is yes. Exposure to different chemical substances can cause us harm. The level of harm and the length of the exposure vary from substance to substance. To determine the risk of harmful health effects from a substance, you must first know how toxic the substance is; how much, and by what means, a person is exposed; and how sensitive that person is to the substance. There are three main ways that we can get exposed to toxins and we are going to break them down for you. Here are 3 ways that toxic substances can enter your body. 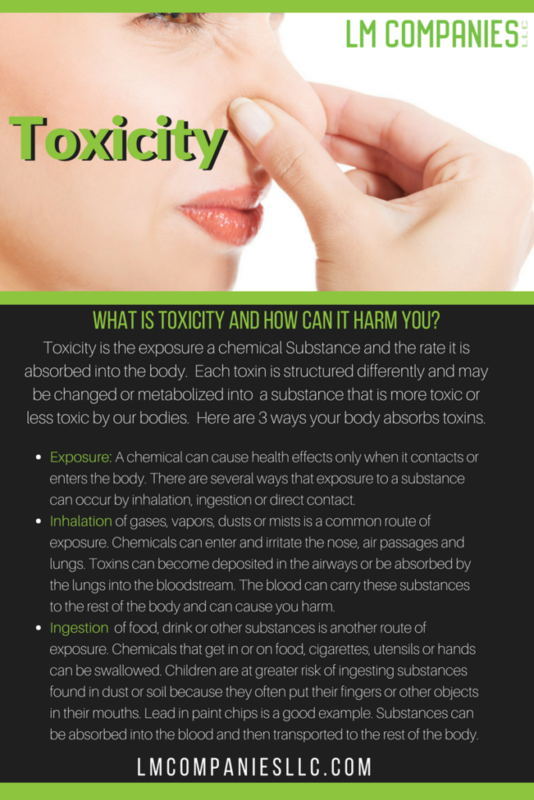 This entry was posted in BLOG and tagged how toxins enter your body, Toxic, toxicity.